Political move ahead of PA elections? A senior Hamas source told the London-based Arabic-language al-Hayat newspaper on Saturday that the Palestinian organization has joined the global movement of the Muslim Brotherhood. According to the source, the move took place as early as two months ago. The expression "a branch of the Muslim Brotherhood – Palestine" has been added to Hamas' official name – "The Islamic Resistance Movement." The source added that the move had nothing to do with recent changes in the Middle East following the Arab Spring. "Following thorough discussions, which lasted more than a year and a half, we saw the need to take this step as the movement is growing and there was a need to lead it to independence instead of being dependent on the Muslim Brotherhood organization in Jordan. "Hamas no longer belongs to any organization, but has become completely independent," he said, adding that the group was now part of the global Muslim Brotherhood organization and was officially represented there. Despite its official admission into the global organization, the source noted that Hamas would continue carrying the flag of armed resistance. "We'll continue to be different due to the presence of the Israeli occupation in Palestine, and the problem will remain as long as there are occupation forces," he said. He explained that the movement's treaty says Hamas is the jihadi wing of the Muslim Brotherhood movement in Palestine, and that joining the global organization won't solve this dilemma. The newspaper reported Friday that Arab and Western elements advised Hamas to rebuild the Muslim Brotherhood wing in Palestine in order to attain international recognition following the Muslim Brotherhood's growth in Arab countries as a result of the Arab Spring. Some of the movement's leaders objected, however, claiming that turning the movement from a resistance organization into a political group would weaken it. 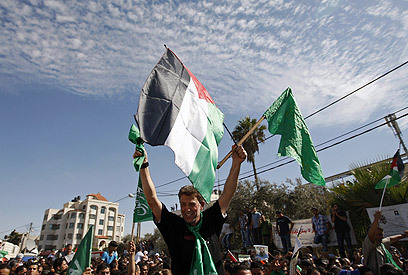 One of the proposals looked into was to establish a new political movement called "Freedom and Justice", similar to the Egyptian party affiliated with the Muslim Brotherhood, which won the majority of votes in the first round of the Egyptian elections, in preparation of the elections expected to take place in the West Bank and Gaza next year once the reconciliation agreement between Fatah and Hamas is completed. See all talkbacks "Hamas joins Global Muslim Brotherhood "